Donnie Yen (Blade II, IP Man, Hero) and MMA fighter Cung Le star in this gripping martial arts blockbuster set in the bustling metropolis of Hong Kong in 1905. The revolutionary movement has spread throughout China, but the corrupt Qing dynasty will do anything to hold on to its power. 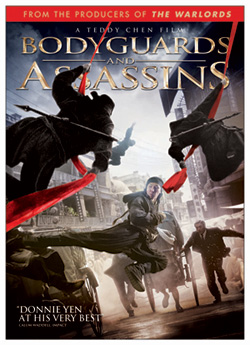 As Sun Yat-Sen prepares for a historic meeting that will shape the future of the country, a motley crew of men and women are entrusted to protect him from a group of deadly assassins who will stop at nothing to kill him. Winner of eight Hong Kong Film Awards, including Best Film, and featuring an hour-long battle sequence unlike anything attempted before, it’s a pivotal action epic that’s being hailed as “a satisfying mix of politics, personal sacrifice and death-or-glory combat” (Richard Kuipers, Variety). While the film had well-recognized talent in Asia, and had won numerous accolades, we faced the challenge of marketing this title in the US market almost a full-year after its theatrical release in Asia and other markets. The film was loosely based on a famed 1905 visit by Dr. Sun Yat Sen to Hong Kong, where Chinese independence (finish rest….keep tight). We opted not to promote as a “based on a true story” as was the case in Asian markets. 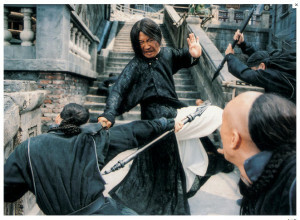 We felt that might nudge the film towards a drama genre and loose interest upon action-martial arts genre fans. We enlisted the support of one of the stars, Cung Le, a champion in mixed martial arts here in the US, who made his film debut in the film. We secured his support via social media messaging and a very robust radio sweepstakes program, offering Cung Le autographed gloves, amplified by a campaign running across the myriad of MMA fan sites, blogs and forums and social media channels. Securing an impressive space at Comic-Con yielded a phenomenal opportunity to reach the several hundred thousand vocal and viral fanboy base. Situated in the top traffic corridor adjacent to Warner Bros. And the live event broadcast on G4TV, a massive digital display (measure) featured the trailer. Buoyed by the in-tandem press event announcing the live action production of Afro-Samurai, led by Samuel L. Jackson, we carried the message further. We also enlisted the support of Ryan Kwanten, star of True Blood (promoting another one of our titles) to draw enormous crowds for autograph and meet and greet sessions. Give-aways be costumed street teams both inside Comic-Con and the in the blocks in the surrounding San Diego area carried the message further, as did giveaways of highly sought after collectable vinyl art, signed by the artist on site. We had secured 4 tastemaker screenings at the nearby Landmark Theaters that evening, further promoted by online, radio, social media and street teams to pack audiences in once the Comic-Con halls had closed. Further bolstering home video sales, we secured an impressive full-length “making of” film called “Development Hell” which chronicled the “cursed” production set that was befallen by numerous fatalities and a massive fire that destroyed the entire 5 3 city block set recreating turn of the century, Hong Kong. Sony Playstation (was it Xbox! ), who had just ramped up its video on demand platform integration, sought points of distinction from iTunes. Offering the content as a bonus exclusive to Xbox, B&A was provided premium promotional positions across the network.